OPEC stands for the Organization of Petroleum Exporting Countries. It is an intergovernmental organization, created in 1960 at the behest of Iran, Iraq, Kuwait, Saudi Arabia, and Venezuela. These five countries are commonly called the Founding Countries of OPEC. If you stare hard enough at the OPEC logo, you might see four barrels of oil. Of the lot, there are some countries which had suspended their membership and rejoined the organization. Ecuador suspended its membership in December 1992, but rejoined OPEC in October 2007. Thus, only Indonesia is currently "inactive", and so, there are now only 13 "active" members. to coordinate and unify the petroleum policies of its Member Countries and ensure the stabilization of oil markets in order to secure an efficient, economic and regular supply of petroleum to consumers, a steady income to producers and a fair return on capital for those investing in the petroleum industry. Thus, it's basically an oil cartel, to fix oil prices. Note, their goal is income: "Oil markets", "steady income", "fair return on capital". Note, their KPI: "Efficient, economic and regular supply of petroleum". Note, their means of achieving their KPI: "coordinate and unify the petroleum policies of its Member Countries". And notice that nowhere is the word "cut" mentioned. But production cuts are a part of OPEC's policies. Malaysia, conspicuously, is not a member of OPEC. It must have had numerous opportunities to join OPEC, but for some strange reason, it has not become a member of OPEC. Malaysia seems to be qualified to join OPEC as a "full member", which, according to the OPEC statute, states: "any country with a substantial net export of crude petroleum, which has fundamentally similar interests to those of Member Countries, may become a Full Member of the Organization, if accepted by a majority of three-fourths of Full Members, including the concurring votes of all Founder Members." 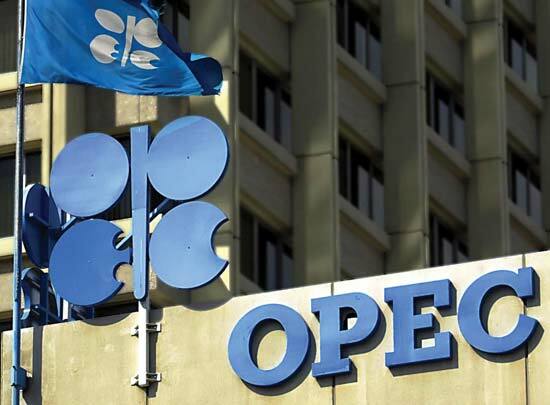 Malaysia would not be the only oil exporting country that does not join OPEC. When considering other oil exporting nations, it shows that OPEC's membership fails to include all the major oil producing countries, such as Brunei, Russia, and the USA. Some people forget, the USA is also an oil-producing nation. Sometime in December 2016, Malaysia was among a delegation of non-OPEC countries that negotiated with OPEC to reach an agreement to cut production. Some of the other non-OPEC countries that participated in the pact include: Azerbaijan, Bahrain, Bolivia, Brunei, Equatorial Guinea, Kazakhstan, Malaysia, Mexico, Oman, Sudan and South Sudan. That pact, reached in December 2016, is crucial. Because the market for oil is global, OPEC's coordinated policies among its member nations will be ineffective unless non-members also follow its policies. In this case, it's a policy to cut production so that petrol prices will go up again. If you live in Malaysia, you no doubt have realised that the Ringgit's exchange rate (to the US Dollar) has plummeted terribly. While it is a worldwide phenomenon in the wake of Donald Trump's presidential election victory (and his election promises), the price of oil also affects the economy of oil producing nations. Basically, better oil prices mean more income for the nation. And more income means more government spending. Which leads to better quality of life for citizens. Logically, that is. Cut the supply, and market equilibrium will shift to a higher price. That's a tricky question. If Malaysia joins OPEC, it must follow the policies of OPEC. 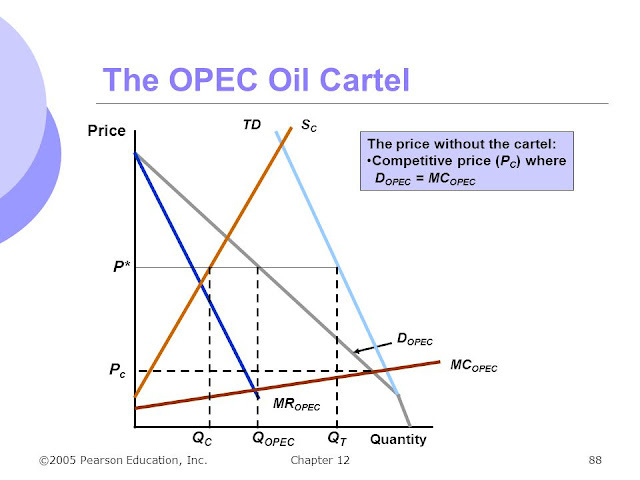 But it seems that not all OPEC member nations need to cut their supply equally. For example, in the recent pact to reduce output, Nigeria and Libya were exempted from production cuts due to civil strife. Non-member countries can promise to cut production (as has happened) and yet fail to cut production (as Russia failed to do, 15 years ago). At the same time, it is also tempting to increase production of oil when oil prices have surged. Malaysia could bump up its production during oil price surges, and benefit from the increased profits. 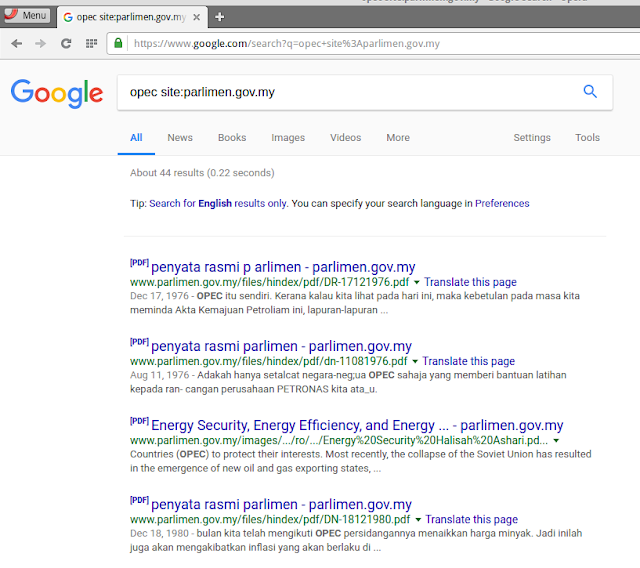 An examination of the Malaysian Parliamentary records will show that OPEC has been discussed from time to time in our Parliament, and its policies also exert an influence on our policies. OPEC has been discussed in Malaysia's Parliament even as early as 1976. Thanks, Google. Of course, if Malaysia does not join OPEC, it does not need to honour any policies made among OPEC nations. It can join them in their merry activities from time to time if it so wishes, as it suits the leaders of this nation, on an ad hoc basis. Incidentally, in the Dewan Negara on 18 December 1980, Datuk Haji Mohd Din Jaafar (a Malaysian Parliamentarian) suggested that it is hazardous for Malaysia to follow OPEC prices. (At that time, USA had not emerged as a major oil-producing nation.) As such, he noted that Malaysia had potential for oil production, as evidenced in the states of Terengganu, Sabah, and Sarawak. The said Datuk suggested that instead, Malaysia should combine with other ASEAN nations to form APEC (ASEAN Petroleum Exporting Corporation), led by Petronas. 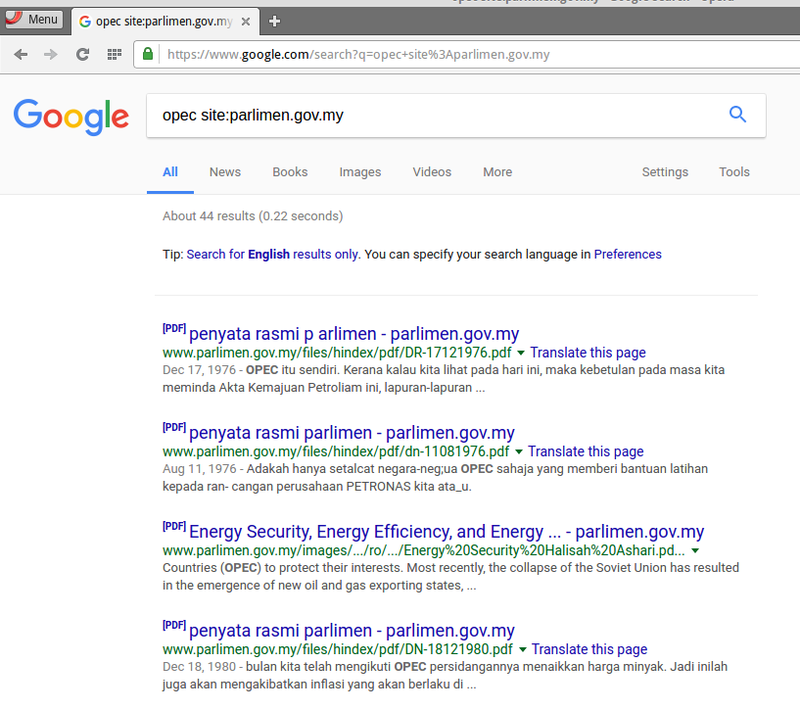 Aside from the Parliament records, I could not find any government website making reference to the said Datuk Haji Mohd Din Jaafar. I did, however, find a blog mentioning a "late Datuk" Mohd Din Jaafar being the deputy chairman of the Sabah Electricity Board (LLS). I'm not sure if it's the same guy. Anyway, having considered the mission of OPEC, I've come to the conclusion that Malaysia is better off not joining OPEC. There must be a reason that it has never joined OPEC. That fact is as good a reason as any other not to join OPEC. Here are some other pieces from me. RM40 billion oil revenue loss this year. The Star Online, "Malaysia among countries slated to attend oil production cut talks". 10 December 2016. This is a very detail report. Thanks for sharing this to us. This indeed offered me a second thought of what is really best for Malaysia - to join or not join the OPEC.